There were times when Carter Bennett felt asphyxiated, as if someone was sitting on his chest or thrusting a knife into his lungs. 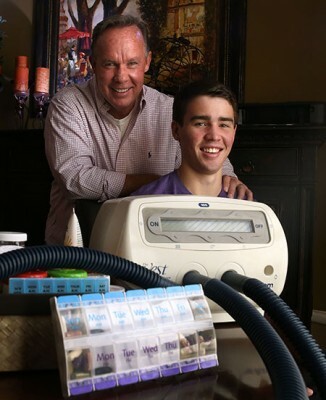 Throughout his youth, the Grand Canyon University freshman relied on his parents, Dave and Kimberly, for relief from the suffocating complications of cystic fibrosis, a genetic disorder for which there is no cure. When Carter was diagnosed at age 9, his father was a software entrepreneur. But the family’s ensuing experience with doctors and insurance companies led Dave into the emerging field of health care information systems. He became focused on the blending of technology with personalized health care. The Bennett family learned to understand Carter’s disease and to investigate his genetic makeup. They tailored his treatment plan by zeroing in on his disease mutation, one that affects only 4 percent of cystic fibrosis patients. They researched new drugs for Carter’s mutation and actually brought information to their doctor about one that has helped him thrive. Today, as vice president of healthier populations at Orion Health in Scottsdale, he develops “precise medicine” solutions that allow doctors and patients to access and use personalized health care data. “I became real passionate about how we can fix the health care system, how we provide docs and patients with more concrete support,” he said. Seeing his son off to college this fall marks a transitional point in the family’s journey.